This covers sole purpose is to keep is to keep leaves and debris out of the pool when not in use. 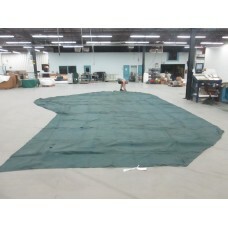 This is a mesh cover that is made with grommets in the hem spaced about every 24” on all 4 sides. NOTE: This is not a safety cover style and will not support the weight of children or pets. Go to Request Quote and Submit your information along with the pool shape/design, pool dimensions, stair and spa dimensions, and color. We also offer Pool Cover Repair Services at both locations and can provide On-Site Measuring for new and replacement covers if needed. Note: Zamzow Mfg. Co. Inc. does not install covers. Pool Debris Cover - Mesh Grommets on the hem all sides. Normally attached by rubber straps to concr..